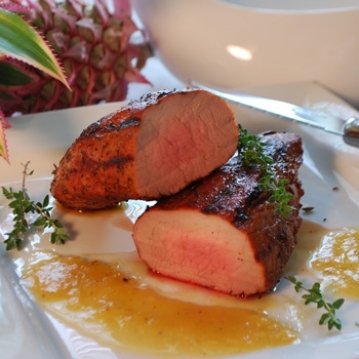 This recipe is flavorful, exotic and easy to make. Try it; you will love it!!! Rub the tenderloin with salt and pepper. Mix the rest of the ingredients in a small bowl and rub onto the tenderloin. Keep in the refrigerator overnight. 1. Mix the pineapple, lemon juice, maple syrup, and thyme in a blender. Add salt, pepper and ancho chile to taste. Pour in a medium saucepan and bring to a boil over high heat. Simmer, stirring for 3 minutes. Let sit for 10 minutes. It can be prepared overnight and then heated before serving. 2. Heat the grill to 400 degrees F and rub it with oil. Grill the tenderloin on all sides until golden brown, 12-15 minutes. Insert the thermometer in the center, it should be registering 145 degree F. Remove from the grill and brush with some glaze. Cover with foil and let rest for 2 -5 minutes. Slice into 2 inches thick. Serve with the rest of glaze and mashed potatoes.